Sometimes you just want a little dessert. All for you, that you can savor and enjoy anytime you want. No going to the gluten free bakery section, no pulling things out of the freezer. Something warm and fresh and yummy. 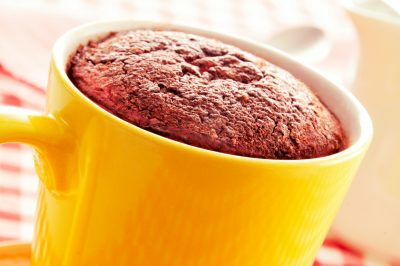 Gluten free chocolate cake in a mug. Make your own awesomely delicious chocolate cake in a mug. Warm, yummy, chocolate goodness just for you. You will need a 12 oz. sized mug or bigger. Whisk together the dry ingredients. Place in the mug. Beat together the egg substitute, milk, oil and vanilla. Pour into the mug and use a fork to mix thoroughly. Pop in the microwave and cook on high for 1 minute or until the top is just dry. If you don’t have any self rising flour you can make your own. For each cup of gluten free flour, add 1 1/2 teaspoons of baking powder and 1/4 teaspoon of salt. Use a whisk or spoon to blend the mixture thoroughly before you use it in the recipe. This gives you enough for a couple of mug cakes. Just store in a small container or zip-type bag. These also make awesome gifts! Just mix together all the dry ingredients and place in a zip-type bag. Make a tag that lists the rest of the ingredients needed and the directions. Place in a fun mug and give. Instant birthday cake. Be sure to include a candle along with it. If you click on any of the links in this blog or on this page, I will receive a small stipend. Thanks so much for helping to support me and my recipes. What is liquid egg substitute? I’m suspicious of substitute anything. I like to use actual, natural products. I realize a whole egg would be too much, but perhaps it could be whisked and measured out, using the balance with additional eggs for scrambled eggs. Yes, you can absolutely use real eggs with this. Just do exactly as you described and measure out what you need. Can you use real eggs instead of the substitute? Yes you can. 1 egg equals 1/4 cup of egg substitute. If you need to use smaller amounts of real egg, use a fork and beat the egg. Then measure out how much you need. You can throw away the rest or freeze it in the amounts that you would use again. Thaw when you want to make another mug cake. I have never seen gluten free self rising flour. What do you use? King Arthur Flour makes a “self rising flour”. It’s their gluten free baking mix. It already contains the baking powder and salt.